Political map of Costa Rica. 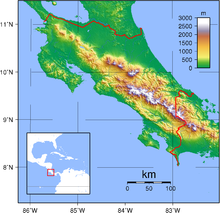 Shaded relief map of Costa Rica. 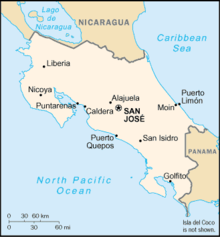 Costa Rica is located on the Central American Isthmus, surrounding the point 10° north of the equator and 84° west of the prime meridian. It borders both the Caribbean Sea (to the east) and the North Pacific Ocean (to the west), with a total of 1,290 km of coastline (212 km on the Caribbean coast and 1,016 km on the Pacific). Costa Rica shares a border with Nicaragua to the north (313 km long border) and with Panama to the south (348 km long border). 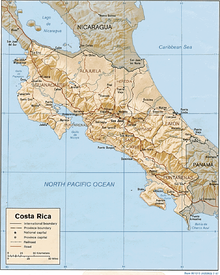 The area of Costa Rica is 51,100 km² of which 51,060 km² is land and 40 km² is water, making it slightly smaller than the U.S. state of West Virginia. The nation's terrain is a coastal plain separated by rugged mountains, the Cordillera Central and the Cordillera de Talamanca, which form the spine of the country and separate the Pacific and Caribbean watersheds. 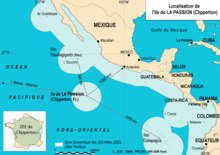 Costa Rica claims an exclusive economic zone of 200 nautical miles (370.4 km; 230.2 mi) and a territorial sea of 12 nautical miles (22.2 km; 13.8 mi). In the eastern half of the country, the San Juan River forms the northern border with Nicaragua. The Tilaran Range is part of the Continental Divide east of Lake Arenal and the nearby active volcano Arenal, and running into the Cordillera Central range further east. It is located in the Abangares district of the province of Guanacaste. At the edge of the range is the Monteverde cloud forest preserve, a major ecotourism destination. The Central Range continues the Continental Divide east of Cordillera de Tilarán. It has four large volcanoes: Poás, Barva, Irazú and Turrialba. The highest peak is Irazú at 3,432 m.
Much of the Talamanca Range is included in the La Amistad International Park, which is shared between Costa Rica and Panama. The country's highest peaks lie in this mountain range: the Cerro Chirripó and the Cerro Kamuk. Much of the region is covered by the forest. The Cerros de Escazú borders the Central Valley to the south and is considered the northernmost portion of the Cordillera de Talamanca. Costa Rica's climate is mostly tropical and subtropical. Like all Central American countries, Costa Rica is considered a biodiversity hotspot. According to the INBio, about 4.5% of the world's biodiversity can be found in Costa Rica. Costa Rica is home to about 12,119 species of plants, of which 950 are endemic. There are 117 native trees and more than 1,400 types of orchids; a third of them can be found in the Monteverde Cloud Forest Reserve. Almost a half of the country's land is covered by forests, though only 3.5% is covered by primary forests. Deforestation is a devastating process, with more than 8,100 ha of forest being lost annually. The main reason for such high deforestation levels is to make plains for cattle ranching. Wildlife diversity is very high; there are 441 species of amphibians and reptiles, 838 species of birds, 232 species of mammals and 181 species of fresh water fish. Costa Rica has high levels of endemism; 81 species of amphibians and reptiles, 17 species of birds and 7 species of mammals are endemic to the country. However, many species are endangered. According to the World Conservation Monitoring Centre, 209 species of birds, mammals, reptiles, amphibians and plants are endangered. Some of the country's most endangered species are the Harpy eagle, the Giant anteater, the Golden toad and the Jaguar. IUCN reports the Golden toad as extinct. Costa Rica is famous for its 26 national parks and more than 160 protected areas. The other types of protected areas in Costa Rica are National Wildlife Refuges, Biological Reserves, Protection Zones, and Absolute Nature Reserves. Together the protected areas comprise over one-fourth of Costa Rican territory. 9.3% of the country is protected under IUCN categories I-V. The creation of the Tortuguero National Park in 1970 gave much needed protection to one of the region's most important and unique natural resources: a 22 km stretch of shoreline that serves as the principal nesting site for sea turtles. Environmental issues include deforestation, largely a result of the clearing of land for cattle ranching; soil erosion; coastal marine pollution; fisheries protection; solid waste management; and air pollution. Costa Rica is party to many environmental treaties, including the Convention on Biological Diversity, the Convention on Environmental Modification, the United Nations Framework Convention on Climate Change, the Montreal Protocol, the Ramsar Convention, the International Convention for the Regulation of Whaling, the Desertification Convention, the Endangered Species Convention, the Basel Convention, the Convention on the Law of the Sea, the Convention on Marine Dumping, the Comprehensive Test Ban Treaty. It has signed but not ratified the Convention on Marine Life Conservation and the Kyoto Protocol. 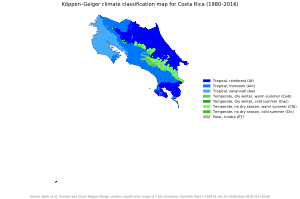 Costa Rica map of Köppen climate classification. Tropical and subtropical; dry season (December to April); rainy season (May to November); cooler in highlands. It is said there are 15 different climates in a day. Hydropower from Lake Arenal, the largest lake in Costa Rica. Occasional earthquakes, hurricanes along Atlantic coast; frequent flooding of lowlands at onset of rainy season and landslides; active volcanoes. ^ Home. Unep-Wcmc. Retrieved on 2012-01-28.